Well my lettuce plugs got moved out to the seedling house. Maybe 1/4 inch tall. The 1020 flat of lettuce is chugging along as well. And, my radishes are up! These were planted in 1801 Deep Inserts, and I specifically planted French Breakfast in 1204 Deep Inserts. Should be interesting to see what yields. The seeds that sowed in the raised beds have yet to pop. My trays are my backup plan. I'm looking forward to seeing your radish results! Me to! Im really curious if it will work the way I want. Just an update. The radishes are growing in the pots and 1204 inserts. I had to thin them out. While I was thinning I had a taste test of a radish green. I was surprised that they are quite tasty. It didnt taste anything like I thought it would. Slightly peppery, with a very subtle green undertone. And finally my lettuce blend is popping up in the raised beds, along with the snap peas. I was hoping they would be further along then what they are, but it seems that we are having a Winter that wont end. For next year, or even later this year, I might build low tunnels over the raised beds, to help with this issue. Just an update. Some things are doing better then expected, some worse. Thats how it goes. The salad mix in the 1020 flat has turned out to be a dud. Maybe sown to thick, or something environmental. Just isnt working out. But, on the other hand, salad mix that I sowed in the raised bed is doing quite well. So well that I plan to do an entire 4x12 bed this afternoon. I have enough to bag later this week to take to the market. An surprisingly the radishes are coming along. All though far from the the claimed 25 days, they are growing in the 1204 inserts just fine. I grow french breakfast also, mine take way longer than the 25 days as well. Glad its not just me then..
Hmmm, that's interesting about the lettuce in your tray. Sister Pickles sowed some in a plastic tub and they're not doing so well either. I didn't put any in a raised bed for comparison. Her radishes in a tub aren't doing so well either but the ones in the raised bed are doing just fine. They're French Breakfast too. Im thinking the 1020 soil level just isnt deep enough to support the lettuce. They have "literally" come to a screeching halt. Thats ok though. The raised bed is doing quite well. Now I wish I had planted a whole bed! I did get that done yesterday though. A brand new 4x12 seeded heavily with my salad mix seed. I weighed what I had, 104 grams of seed. I should probably wright that down somewhere, in case thats the perfect amount. I did have a few radishes in the raised bed pop up. Their not hurting anything, so they can stay. Im thinking the 1020 soil level just isnt deep enough to support the lettuce. Now that's interesting. You'd think that of the two, the radishes with their long tap root would be the ones rebelling against being in a 1020. The soil in Pickles' tub is about 5" deep. GoDawgs.... totally off topic but did you get the Jupiter Peppers started that I sent you last year? I am not at all impressed with mine. They nearly kicked the bucket on the first chilly night, unlike virtually every other pepper plant that I have. They may be highly productive when the weather is good, but other wise they dont seem to tolerate the cold at all. Yes, I did. I have one of those and one of the Keystone. They will be planted out tomorrow. We're headed into warmer weather here. 84 yesterday with a low of 64 this morning but hey, Mother Nature always throws in one more cold spell before May 1. 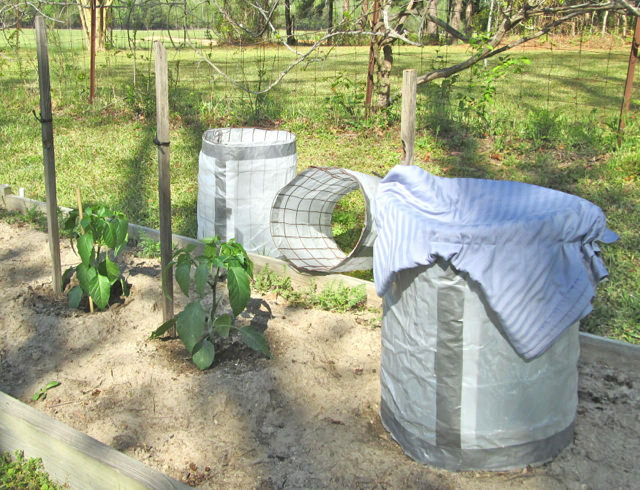 Last year I set peppers out early and had to put plastic covered cages over them a few nights. It worked pretty well. This was last April 9 when I was really trying to push my luck! I'll be ready to do that again if necessary. Ill be interested to find out how those do for you. Im going to plant out what Jupiters survive. Surprisingly the Cal-wonders show almost no signs of cold damage. The only thing I wish, was that I started more. They have been selling like hot cakes. I'm late coming to this thread, just found it. The earlier discussion of varieties including Salanove is very interesting. I tried some mixed salanova varieties (home gardeners package) with not too good results, slow growing and low survival once planted out. Also priced above most kinds. Then I found that High Mowing has 5 varieties that worked very well for me in the same covered, then shaded raised bed. Have taken one cutting and am looking to see which varieties regrow best. The seed is also pelleted and much lower in price than salanova. Plus the lettuce tastes great. I really dont know what to think of Salanova, myself. They make a lot of claims that I only see 1 or 2 people having that kind of success with. I have never tried it, and honestly dont see myself ever trying. At one time I thought about it, but moved on. There are a whole bunch of varieties out there to try, something has to work. So far my own blend is holding up quite well. Now that the temps are warming up a bit, I have been watering 2-3 times daily. In order to keep the greens going my plans involve a shade cloth and misting heads on a timer. If the above works out, the next step is to build a shade house. Probably 12x48.